As I type, I notice that the clematis is coming into leaf in the hanging gardens beneath the turret of Tweed Towers. Bathed in early morning sunlight, this is a propitious sign that we might, just might, be able to get outdoors and spend some crucial time gardening. I feel like I've been cooped up for too many months. we should be out by now, stretching out and offering the old wings to the sunshine in a wing-drying posture. Gardening, as with every occupation, requires the right uniform. Our gardening expert will naturally consider a superb leather jerkin for the heavy jobs (and for nursing of a pint of best bitter in his local afterwards), but I've been contemplating an alternative jacket for the lighter spring jobs — the planting of pansies, the feeding of lawns, judicious pleaching and pollarding, that kind of thing. 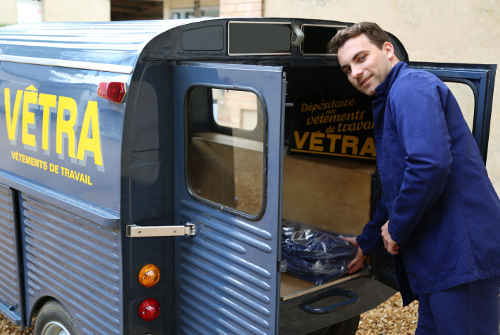 How about a classic Bleues de Travail jacket from Vétra 1927? I'll answer this one myself: it sounds like a good idea. Vétra was founded in 1927 as a manufacturer of industrial-strength workwear basics by Edouard Beerans. Today this thoroughly French company is headed by his grandson Patrick, with great-grandsons Richard and Edouard involved too, I think. I get a bit lazy with my research sometimes, but I'm always happy to correct and retract. It's a quicker way of doing things, but ethically suspect. With this caveat, I believe the clothes are manufactured in Noyant, France. When I say industrial-strength clothes, examples from the early days of the company are still in circulation. The Bleues de Travail gets its name from the indigo dye used to make the original blue versions of the clothes, although Vétra now make clothes in other colours and less 'worky' styles. The original indigo dye fades magnificently over time, and the heavy cotton softens and becomes a second skin. 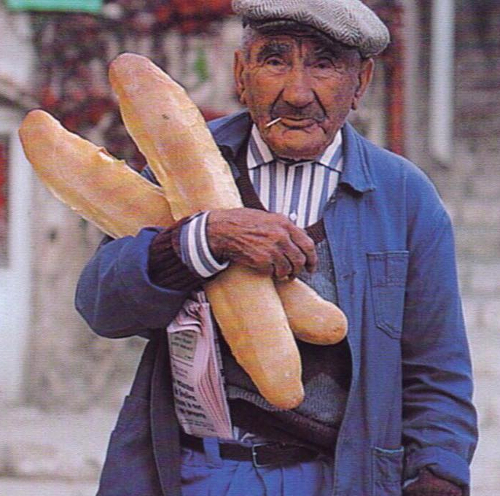 The French chap at the top shows how one might wear a bleu to collect the morning bread and newspaper. I like the blasé way he tucks the newspaper in his trousers. British newspapers are awful, so I think I would tuck an Italian daily in my trews or The Beano. How might our capable gardener wear the jacket? I would suggest forgoing a shirt and wearing a sweater underneath, then buttoning the jacket to the top and tying and tucking a floral silk scarf or cravat in the neck to dress the top. Looking at practicalities, the jacket has pockets to hold your secateurs and seed packets. You have the chest pocket for keeping a pipe. You simply must keep a bag of Lemon and Elderflower sweets, a gardener's favourite, from Sea Sugar of Northern Ireland in one of those hip pockets to be fully prepared. The interior pocket might hold your betting slips if you're listening to the horse racing on the radio. The most famous bleu wearer would be Bill Cunningham (below) the New York society and fashion photographer. He found the bleu to be a really practical jacket for his work. I watched a documentary on Bill. I can't remember who produced it. He seemed like a very sweet-natured and gentle man, which I believe is typical of someone who adopts this jacket. 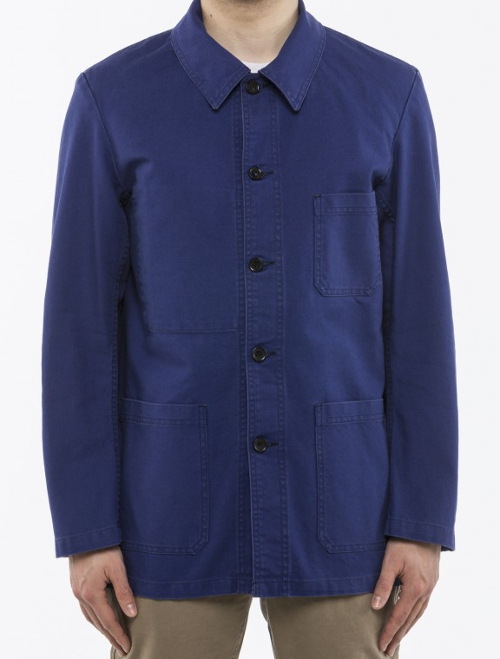 I think a Bleues de Travail makes a great jacket for the garden in springtime. Ah springtime, the only pretty ring time. How that life was but a flower?